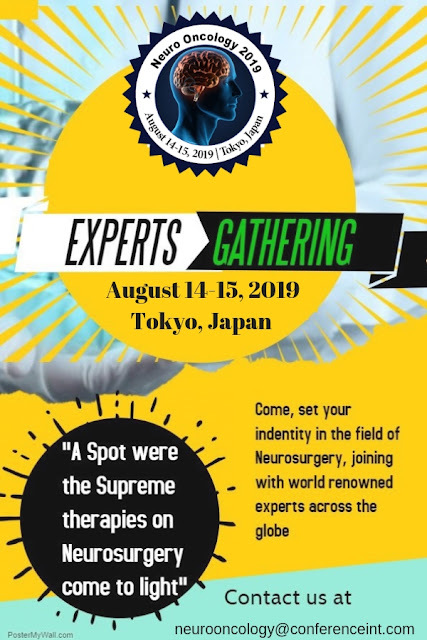 #Neurooncology2019 welcomes #attendees #presenters and #exhibitors from all over the world at #Tokyo #Japan on #August 14-15,2019 we are delighted to #invite you all to #attend and #register. #Register now to #avail #early #bird #offers, and be a #part of this #great#event #Neurooncology2019, which is going to happen at #Tokyo #Japan#August 14-15,2019.Only #few more #speaker #slots are #available.#Grab the #opportunity and #seize your #slot. Brain tumors represent the most common solid tumors in childhood, accounting for almost 25% of all childhood cancer, second only to leukemia. Childhood CNS tumors encompass a wide variety of diagnoses, from benign to malignant. Any brain tumor can be associated with significant morbidity, even when low grade, and mortality from childhood CNS tumors is disproportionately high compared to other childhood malignancies. Management of children with CNS tumors requires knowledge of the unique aspects of care associated with this particular patient population, beyond general oncology care. Pediatric brain tumor patients have unique needs during treatment, as cancer survivors, and at end of life. A multidisciplinary team approach, including advanced practice nurses with a specialty in neuro-oncology, allows for better supportive care. Knowledge of the unique aspects of care for children with brain tumors, and the appropriate interventions required, allows for improved quality of life. Throughout the spectrum of care these patients may have a combination of neurologic deficits including speech and swallowing impairments affecting communication and nutrition, vision changes, motor and sensory deficits, and impairments in balance and coordination. Headaches, fatigue, seizures, stroke, endocrinopathies, and neurocognitive and behavioral changes can develop at diagnosis, after surgery, after treatment, or at end of life. These deficits can improve and even resolve, but for the majority of patients they are chronic or evolving issues that impair function and require referrals to specialists in rehabilitative medicine, neuro-ophthalmology, neurology, endocrinology, psychiatry, and neuropsychiatry. With appropriate interventions and management pediatric patients with CNS tumors can have improved quality of life during treatment, survivorship, and at end of life. The diagnosis of a CNS neoplasm starts with a detailed history elicited by the practitioner. Practitioners must be sensitive to the parents’ anxiety as the questions are asked, particularly if the child has been unwell for a few weeks or months. A meticulous physical and neurological examination is performed. In general, a child who presents with rapidly progressing symptoms in a short time period is likely to have a rapidly growing malignant brain tumor, often associated with surrounding edema. The size and the location of the tumor contribute to the presenting symptomatology. Symptoms occur because of acute or chronic increased intracranial pressure and/or the infiltration or compression of surrounding areas of the central nervous system. Non-localizing symptoms that occur because of intracranial pressure can include headache, vomiting, changes in personality, diplopia from cranial nerve six (abducens) palsy, and papilledema and, in young children, rapidly increasing head circumference. Headaches that are new or have changed in nature from previous headaches, wake the child from sleep, occur upon awakening and worsen with the Valsalva maneuver are considered red flags.2 Headaches accompanied by nausea or vomiting, particularly if vomiting relieves the pain, are particularly concerning. Localizing symptoms occur because of the tumor’s location although there can be some overlap of symptoms. As an example, tumors in the cerebral hemispheres can cause headache, personality changes, memory loss, seizures, focal, motor or sensory deficits, hearing and visual field changes. Midline and suprasellar tumors can present with endocrinopathies, visual impairment and increased intracranial pressure. Cerebellar lesions causing hydrocephalus can also present with signs and symptoms of raised intracranial pressure but may also result in ataxia, cranial neuropathies, hemiparesis and dysdiadochokinesis. Pediatric brain tumors encompass a wide range of pathologic classification. It is imperative to understand the pathology of the tumor because it directly impacts the child’s extent of disease evaluation, treatment and prognosis. The WHO classification system for pediatric central nervous system neoplasms is used to specify the histology and grade of tumors. With our increased understanding of the molecular signatures of many CNS tumors, the WHO classification will be updated in the future to include this information, which may be helpful in predicting prognosis, and possibly suggest new, targeted therapies. Staging of tumors is based upon location and by dissemination within and beyond the central nervous system.1 This information guides the team as they begin to care for the newly diagnosed child or adolescent and their family. Helping families and, in an age appropriate approach, the child or adolescent, understand the significance of the pathology is an important first step in their treatment. Conference Series extends its welcome to the conference 5th International Conference on Neuro-Oncology and Brain Tumor during August 14-15, 2019 Tokyo,Japan with a theme “Future challenges and the latest Impact Factor for Neuro-Oncology and Brain Tumor”. Conference Series through its Open Access Initiative is committed to make genuine and reliable contributions to the scientific community. 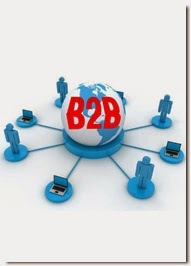 Conference Series llc LTD Organizes 1000+ Conferences Every Year across USA, Europe & Asia with support from 1000 more scientific societies and Publishes 700+ Open access journals which contains over 100000 eminent personalities, reputed scientists as editorial board members. 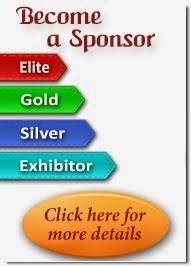 Neuro-Oncology 2019, Conference will focus on educational research directed toward its impact on clinical outcomes, through oral and poster presentations, educational workshop sessions, and influential plenary presentations. Neuro-Oncology 2019 is a perfect platform to find out how Neuro-Oncology research innovations helpful to the Medical, Health and human society. Conference will mainly focus on the trending topics during presentations of the two-day event, which reflect current education, research, developments and innovations internationally in the field of Neuro-Oncology and medical sectors. 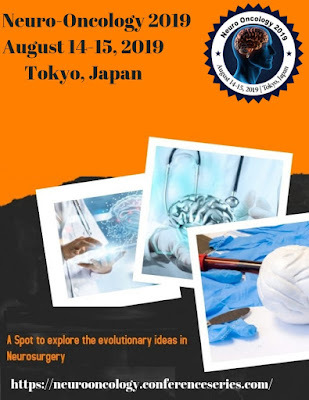 Conference series llc Ltd invites all the participants from all over the world to attend “5th International Conference on Neuro-Oncology and Brain Tumor " during August 14-15, 2019 in Tokyo, Japan which includes prompt Keynote Presentations, speaker Oral Talks, Poster Presentations, and Exhibitions, Sponsors, Workshop, Media partner. Conference series llc LTD invites all the participants from all over the world to attend “5th International Conference on Neuro-Oncology and Brain Tumor" during August 14-15, 2019 Tokyo,Japan, which includes prompt Keynote Presentations, Oral Talks, Poster Presentations, and Exhibitions. 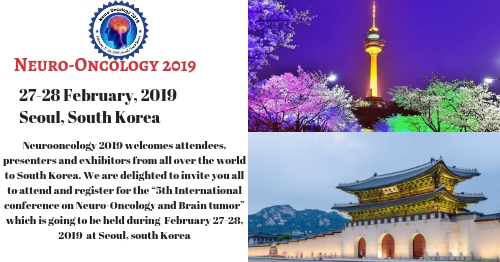 We are happy to bring to your notice that Conference Series llc LTD is hosting the "5th International Conference on Neuro-Oncology and Brain Tumor" (Neuro Oncology 2019) along with external scientific association with the Academicians, Directors, Laboratory researchers, Professors, Associate Professors, Professionals, Lecturers, Scientists and students, around the globe, scheduled on August 14-15, 2019 Tokyo,Japan. #Register now to #avail #early #bird #offers, and be a #part of this #great #event #Neurooncology2019, which is going to happen in #Tokyo,Japan #August 14-15,2019 Only #few more #speaker #delegate #slots are #available.#Grab the #opportunity and #seize your #slot.